No, this is not a story about the horns of four legged creatures, although I did encounter them frequently on the streets of Indian villages. This is a story about my experience with motor vehicle horns in India. 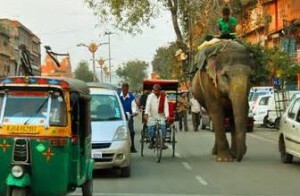 My first introduction to India took place during my graduate student days at the University of Illinois. My buddy Kumar, a studious and gentle fellow from India frequently invited me, saying, “You should come to India” “You will like India and India will embrace you”. I lived in and otherwise visited repeatedly many countries in Europe and in the Americas, even in northern Africa. Never thought I will make it to India though. It finally happened. I landed in New Delhi after a long 13 hours, non-stop flight from the United States. Dehli – Encyclopaedia Britannica Multimedia Edition. 2010. I was invited by my friend Melinda to attend her daughter’s wedding ceremony and the receptions taking place in several cities/villages. Her daughter was to marry a young Indian businessman. The young couple was already waiting for our party of 10 at the Delhi airport. They had flown in a week earlier from their home base in Florida. Readings, conversations, photographs, videos, movies etc. could not have done justice to the vastness and richness that India opens to the eyes of its visitors – there is more to India than the Taj Mahal, you know. I did get somewhat of a hint about a particular Indian phenomenon I was to experience a couple of days before departing. It happened while tuning to All Things Considered (ATC), a daily program broadcast by NPR (National Public Radio). It is something I usually do if I find myself driving somewhere in the country at its broadcasting time. At the end of the interview of an executive of the Indian automotive company known as TATA, the reporting included a bit of a reality check for the benefit of the radio listener. It consisted of a cascade of sounds to be heard once you are trafficking the streets of an Indian city or village. In a way this reporting prepared me for the unavoidable and ubiquitous sounding of the HORN of the motor vehicles. When you are negotiating the streets of India, whether a pedestrian, an automotive driver or passenger, you have to know how to read, so to speak, the sounding of the horn of the vehicles around you or nearing you, as if your life depended on it, which in many, many cases it does (a knowledgeable Indian host shared with me a recently media reported statistic that close to seven (7) people die daily in the streets of Delhi – hit by vehicles). We landed in Delhi late that evening. The wedding couple hired a cab to rush us to the hotel for us to be rested and ready to leave very early next morning to attend the first wedding ceremony, which will require many hours of traveling by plane, train and car. The taxi driver was a very gracious individual and his driving did not prepare us for the horn phenomenon we were to experience the day after on the way to the airport – a domestic one. As a matter of fact, at the Groom’s request, the taxi did slow down enough for us to enjoy a little sightseeing. For the morning ride to the airport the wedding couple had hired several taxis to transport the whole party of twelve, which by this time included the wedding couple, and three pieces of luggage each, on the average. Our taxi was an SUV type with three rows of bucket seats. It was in immaculate condition, inside and out. Our ride with our particular driver turned out to be an adventure and a revelation. To be certain, every mode of transportation we took in any of the cities/villages was a source of wondrous revelations. But in this particular instance in addition to the driving adventure, the ride revealed to us the improbable but vital** role the vehicles’ horn plays in bringing order to a seemingly chaotic road trafficking. Leaving the hotel for the airport we turned right which placed our vehicle smack into a roundabout – an unmistakable vestige of British colonial ruling. 35 m/h! that is the estimated speed of the vehicle negotiating the roundabout and bullying into the rushing vehicles, resembling the attempt to squeeze five sausages with room but for three. Melinda asked Mr….. why are you passing on the left instead of the right, as you are supposed to? “Because it is the shortest way”, said Mr…… Such speedy turns and the aggressive competition for space had its consequences. One had to hold on to something for dear life. But more telling was that for Melinda, to my right, it was too late to hold onto something. In the middle of the turn, she was practically flung out of her seat. She could not stop laughing almost hysterically as I tried to help her to right herself. Of course, her intent at protecting her expensive digital camera did not help. Is everybody ok? asked Mr…. in a calmed voice. Yes, was the reply by all, after regaining composure. At the same time, we could not escape hearing the rising cacophony of horns played insensately, with all vehicles demanding passing room. “Wow! It is a miracle no accident happened just then!, shouted Tom. More “miracles” waited ahead. All throughout our driver exuded confidence; in fact enthusiasm and enjoyment will best describe his body language while seeing the passenger’s reactions to his driving skills, his ability to sort out what Tom, in the front seat, nervously called “sheer madness”. “Have you ever killed somebody? Like in most modern cities, Delhi displays safety street pedestrian crossings. Like in any world city, Delhi pedestrians are not unlike others; they also may throw safety to the winds. But because of their sheer numbers, the jaywalkers make almost compulsive the use of the horn. Passing is done on the right side, as our driver this time was intent on doing. But this time it placed our vehicle next to the median of the road. The median was a narrow one and just ahead some pedestrians spilled over in the way of the rushing vehicle including ours. Our driver incessantly played the horn and as loud as possible, which meant exactly what we felt, no slowing down of the car. We saw no pedestrians moving either; but just when we thought the collision was inevitable we were through, without hitting a vehicle or a pedestrian! Tom could not hold back any longer and posed the question “have you ever killed or maimed anybody?” “Never” was our driver’s emphatic reply. Continuing the ride meant also hearing the uninterrupted sound of the horns, making us aware of surrounding vehicles demanding also room on the road. It meant also our driver negotiating several more roundabouts. But with each new one our confidence on Mr. …’s driving skills seems to grow; to the point of entertainment and triggering some laughs on our part. We finally made it to the airport. After helping us out of the vehicle the driver posed with passengers with me taking the photos. All of sudden we realized the rest of the caravan was nowhere in sight. We waited between 12-15 minutes before their joining us. We also realized “that was some driving feat”. The “tardiness” of the other taxi drivers also led us to realize Mr …’s feat was an exceptional one. 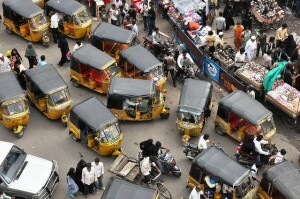 Now, in Kolkata, where we did more taxi riding, it is hard to imagine Mr. … could have made much headway. One can envision him engulfed in total frustration and ready to give up around the next corner. To be sure use of the horn is even more important in Kolkata. Kolkata streets and sidewalks are teaming with people and all sorts of modes of transportation, including animal based and the ubiquitous Rickshaws. Some visitors from some foreign countries frequently confessed to suffer at the sight of poverty and filth. 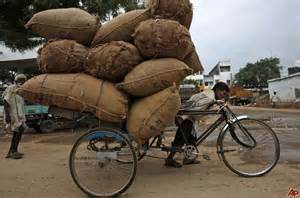 But, suffering is not what grips your heart upon witnessing the hard working people of Kolkata. Everywhere and every day and night Kolkatans are hustling, eking out a living, sweating in the heat and smog of the city. ** (But, you may ask, why does the horn deserve to be labeled, let alone be considered “vital”? There are several reasons, according to my observations. The main reason is that although in urban areas the roads exhibit lanes, drivers in India ignore them, essentially treating the painted lines as reassuring signs they are going in the right direction. Thus, whereas in other latitudes motor vehicles would be restricted to one per lane (with possible severe penalties for violators), in India drivers straddles the lanes at will and similarly “create” additional transit corridors at will. The result is that in the space “defined” for the transit of two vehicles one can find three vehicles alongside each other “sharing” that road segment – with the three drivers playing simultaneously their horns, full blast. Indeed the circumstances call for full blasting horns, don’t you think? Another reason is that pedestrians, bicyclists and motorcyclists and rickshaws “challenge” motor vehicles in the road competition. In villages’ roads, with the former housing the majority of India’s population, there are no traffic lane demarcations. The roads themselves are narrowed and many a time darkened by blackouts. Drivers of motor vehicles are compelled to use the horns more frequently, more incessantly and in response to different challenges. The traffic conditions are such that the motor vehicles seldom can reach speeds beyond 25-30 m/h. The same drivers confront road space competition from four legged animals, from loaded two-wheel carts, pushed or pulled by humans, and even from clients of ambulant merchants; the latter setting up shop practically on a piece of the road. The motor vehicle driver is force to horn his way (I saw no woman driving in rural India) through incoming bicyclist and motorcyclists from both sides of the road in many instances. Incredible, I saw no accident ever happening. If you go, do ask if the car horn is ok. Finally, if you go to Delhi, and you find yourself in a “time is money” situation, you may want to seriously consider contacting a taxi company able to assign you a driver with skills similar to Mr….. In any event, make sure you appreciate two important facts, one that there is a method in the seemingly chaos of Delhi’s vehicular traffic. And that the vehicle’s horn is king… or queen. And by the way, before you embark on a vehicle, make sure to ask the driver if the horn is in working order. For other of my travel stories visit Travel page.